Making a very balanced and even positive championship Taking into account the purpose of the stay, Nimes remains in 12th place in the table with 26 points in 20 matches, a record that leaves the team nine points above the zone of possible descent and only two of Reims and Bordeaux. The moment is not the best, because in the last six games Nimes lost five, having won only two rounds in the league, in the reception to Nantes (1-0). Last Saturday, he was beaten at home by Toulouse (1-0). The Angers appear a little lower in the standings, namely in 14th place, with 23 points, less three than the Nimes and the same of Nantes. 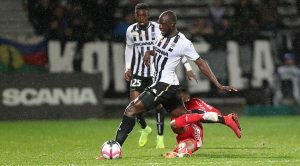 In the last round, the team won 1-0 at home to Nantes, returning to the win after seven consecutive games without feeling the taste of victory. An encounter between two teams that fight directly for each other by the maintenance in the first step of the French soccer, and Nimes will have the advantage of playing at home against an opponent who despite having scored on several occasions outside wins little away from their fans. In a game that historically has scored a lot of goals, between two teams with unconvincing defensive records and who should want to take advantage even in a possible tiebreaker in the direct confrontation, I believe that we will have attack soccer and goals.